Seafood Nutrition Partnership is excited to announce the launch of Fish Finatics, an influencer program specifically for Registered Dietitians who love delicious seafood and have a passion for sharing tasty tips. Just like you, we’re committed to healthy eating. That’s why we’ve created Fish Finatics, a group of nutrition professionals to work collectively with us to help educate people about sustainable seafood. Become a part of the exclusive community, where we’ll host fun events, contests and challenges while also sharing resources to help make your job easier. Once you participate in challenges, you’ll earn points for the chance to win seafood swag, like cookware, kitchen accessories, cookbooks, tasty treats and more. All you have to do is sign up here. Once you sign up, you’ll take the pledge to eat #Seafood2xWk and stay tuned for our first challenge starting on September 12. Don’t forget, National Seafood Month starts October 1 and you’ll want to be a part of this fish fiesta! Speaking of National Seafood Month, Seafood Nutrition Partnership is hosting a month full of seafood celebrations. Want to get involved? 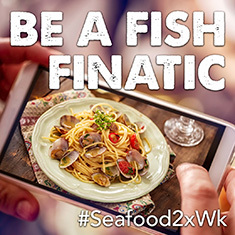 Check out how you can help spread the #Seafood2xWk message here. Attending FNCE® this year? Be sure to stop by Booth 2527 for your omega-3 fix. Stay tuned for more info as we get closer!